Metallica Through the Never is a concert film meets narrative thriller. Dane DeHaan and Metallica star in Metallica Through the Never. Win a chance to see Metallica Through the Never at home. Enter now to win a free showing of Metallica Through the Never! Metallica Through the Never Review: Rock & Riot! Our Metallica Through the Never review finds it so much more than a 3D IMAX concert movie. 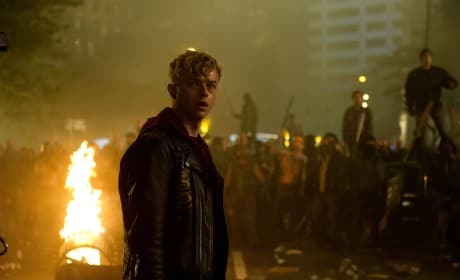 Dane DeHaan (The Amazing Spider-Man 2) stars as a roadie sent into hell... all while the band rocks through a fiery set of their greatest songs. 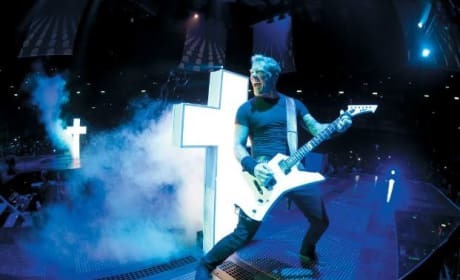 The first still from Metallica Through the Never has landed. The shot features The Amazing Spider-Man 2 star Dane DeHaan in action.